Simple movie-editing is the focus this week on Moore In the Morning where I review an app that makes adding effects and cuts to your home movies as easy as playing Super Mario Bros. I also explore an update to foodie favourite and GPS restaurant guide Foodspotting plus an interactive iPad bedtime book for kids… on bats! Can your little ones make convincing bat sounds? We’ll find out. Have you ever tried a Bacon Fudge Sea-Salt Milkshake? Thanks to Foodspotting I’ve found a place where I can try one right next to our radio station (Holy Chuck Burger). And judging by the photo someone added, I might need to bring a friend to help me home. 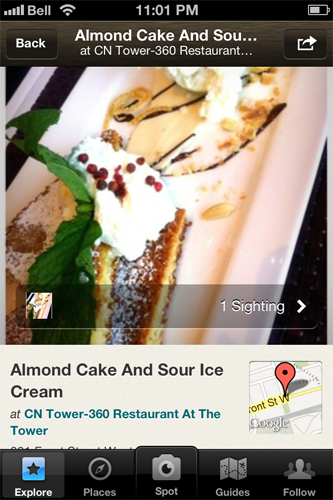 Foodspotting lets people share their favourite dish discoveries. You use your cameraphone to snap a picture of a meal you like and then upload it, packed with all the details and GPS location to make it easy for others to find. Foodspotting has been out for awhile now, but this week it’s been completely revamped to offer better recommendations. It will scan for meals in your area, let you flip through photos of them, and remember which ones you like and which ones you’ll take a pass on. It will connect you to selections made by your friends, and feature special guides written for cities across North America. It’s a great way to discover adventurous meals and keep track of the ones you’ve tried. Here we have movie-editing for dummies. The controls are similar to those of a Super Mario video game. 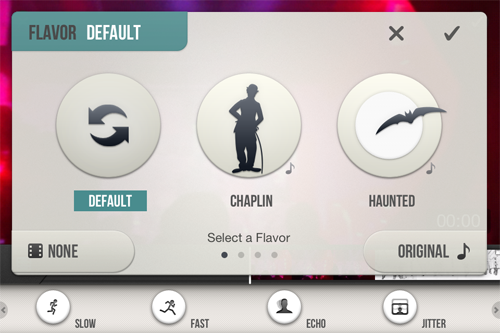 You press play and while the movie is running, tap buttons to turn on and off actions. 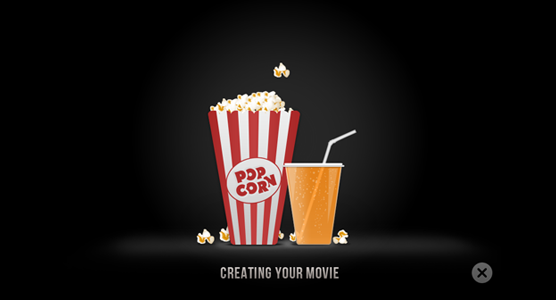 You can slow the movie down, speed it up, make the voices sound like chipmunks, add zooms and even mirror effects. There’s no timeline or multiple tracks or dragging-and-dropping to worry about, you simply press play and then hit a button to add what you need – narration, music soundtracks, even laugh tracks or sound effects. It’s the same idea with making cuts and joining clips together. Jump run the video and press a button when you want a cut made. When you’re done you can upload it directly to Facebook or YouTube to share. Very slick, very simple, and full of powerful tools. Bats have become a popular fascination for kids with exhibits on the nocturnal mammals breaking records for museums and science centres. 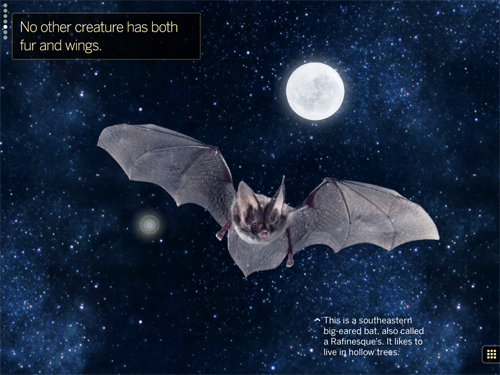 This inventive children’s app is part storybook, part theme park ride, using robust animations and 3D video-game like environments to let kids explore the different species of bats and the caves they hide in. Kids can scream into the iPad’s microphone to simulate echolocation and tilt it like a plane’s yoke to guide a bat through its flight over a forest. It features incredible photography filled with hidden “touch and learn” spots and includes built-in narration for those who need help reading. A very imaginative and friendly look at a popular night time creature, you could say it makes for a perfect bed-time story.